Experience the luxury of a clean, comfortable inviting accommodation. With a bedroom on the main (street level,) there is no need to climb excess stairs. Your temporary residence is warm and cozy and more than you may anticipate. Your temporary private home is tastefully furnished with neutral colors and a splash of color. It has a modernly equipped full size kitchen with quartz countertop & stainless steel appliances along with new hardwood and tiled flooring. Coffee maker, electric kettle, and toaster are provided along with pots and pans and utensils. Expect bottled water that will quench your thirst upon arrival. A toasty robe and slipper await you after a warm medium/high pressured shower or bath in an earth-tone spa ambiance. During your stay, expect your bath and kitchen essentials to be on hand. Simply feel right at home! Included in your stay is complimentary scheduled housekeeping service for stays of 21+ days. Your peaceful retreat includes high speed Internet with Wi-Fi, Ethernet Cable, HDMI and video aux cord provided with a 50" Flat screen 4k Smart TV in the Entertainment room (TV Room.) An additional TV with DVD combo is also provided for movie watching or music playing so be sure to bring your favorites along if you choose. A desk with office amenities are provided; supplies included are from stapler to color printer and office essentials are on hand for your convenience. Please express the need for any additional amenities and we will do our best to provide a stay custom to your desires. You may arrange a longer stay and perhaps invite family and friends to experience hiking and other activities that Connecticut and its neighboring states have to offer. **NYC is only a 2-hour ride away so plan a full excursion while you're with us! Your stay is sure to foster productivity, serenity and excitement. Come and stay a while! Note: This is a Newly Remodeled 1950s Home with Driveway and Grassed Yard along a tree lined block in a jog/bike-friendly neighborhood centrally located to many corporations, malls and within minutes to the Interstate-84 highway and other public transportation. **Primarily a 1-3 Month minimum stay requirement; 1-7 day minimum stays are offered periodically. Feel free to submit a reservation request and include any questions, comments or concerns. Hospitality is in the heart. Clean, comfortable, hospitable and quaint with your needs in mind! For long term stay, Private massage treatment can possibly be arranged in home! View more about Chana M.
Newly renovated bathroom with soaking tub, porcelain tiled floors with a wood look and spa-like ambiance. Shower head provides exceptional water pressure and great comfort, bathroom is equipped with towels, sufficient lighting, fan, scale and toiletries. Portable A/C unit provided during summer months. Multi-speed Air purifier is provided. Ceiling fans installed in lower floor rooms including 1 bedroom Portable fan available upon request. Natural Gas hydronic heating. Home has great heating! Please set thermostat to a comfortable temperature and keep it within 4 degree range. Ceiling fans can be used counter clockwise to balance heat. Fresh clean bed linen and pillows provided (+Xtra;) include comforters, throw and blanket and Extreme comfort Memory Foam mattresses encased in sealed full mattress protector. Expect a pleasing rest. On site washing machine in basement. Please use washing machine sparingly. Pick up/delivery laundry service can be arranged if you have difficulty going up and down ~15 steps. Tumble dryer is in basement. Please use sparingly and remove lint after each use. For those that can not walk the stairs, pick up/delivery laundry service can be arranged. Please Do Not use fireplace; Maintenance is required. Uncovered driveway parking for 3-4 vehicles. Can possibly arrange additional Parking. Sufficient wash cloths/rags, bath, hand and kitchen towels are provided. All products are of good quality. You are able to stream movies and enjoy the internet anywhere in the house. **Small safe provided upon request at an additional cost. ~400 sq ft of living space with a large sofa/sleeper, coffee table, recess lighting and lamp. Full size stainless steel dishwasher. **Please use dishwasher sparingly. **Please use 1-hour wash option. 5-burner Stainless steel gas stove/oven combo with griddle/warmer, timer, clock, and oven light. Large kitchen appliances are all new and stainless steel. Stainless steel 5-range gas stove/oven with light. Temperature is operated by button at very top of stove. Stainless steel over the range microwave with light and fan. **Use microwave food cover always to avoid food splashing. Please wipe out microwave with soft cloth/sponge after each use. Coffee maker with filter can accommodate coffee beans. Holds 2-4 slices of bread at a time and has temperature gauge. Dry Seasonings provided. Sea salt in grinder, whole black peppercorns in grinder, Italian herbs in grinder, and extra virgin olive oil. Mini ketchup is also provided. Place setting for a minimum of 4. Unbreakable children's plateware provided. Newly renovated full size kitchen, fully equipped with stainless steel appliances, pots and pans, seasonings and kitchen essentials. Since most use smart tv app, basic antenna TV svc provided; Xfinity Cable to be arranged upon request. **Request must be made at or immediately after booking. Specify movie/sports pkg/desired Network. 32" TV with built-in DVD player. Small library of Adult and Children's books age 5+ are provided throughout the home. Playing cards & several popular board/wooden games provided. Few children's DVDs are provided. Large grassed rear yard. (No deck currently.) Outdoor bench is provided. **Additional outdoor furniture soon to come. Limited adult and children's bikes available for an additional one time charge once available. 3 low steps to enter/exit home. Occupant challenged by stairs should use bedroom on street level. Bathroom, kitchen, dining room and living room are also on street level. Bathroom can Not accommodate a wheelchair. **Please specify in booking if a wheelchair will accompany you. **Rental stays over 2 months are welcome. 1 Complimentary massage service provided for a long term guest staying 60+ days. (US $125. value) Housekeeping service provided bi-weekly or monthly for long term guests staying at least 1 month. Dates to be pre-arranged bi-weekly. Please arrange first cleaning session 1 week after check in. Car booster seat can be provided upon request. Great communication and everything was truly incredible. The house was clean and everywhere was immaculate. It feel like home away from home. The bed was comfortable. The experience was amazing and I will definitely return and recommend this place to everyone. I had some bad experiences at hotels, dirty bathroom, bed and more. I love that they had the place spotless and inviting. Tia, Thank you so much for taking the time to submit a review; it's appreciated. I'm so happy that you enjoyed your stay and wish that you could have stayed longer. I look forward to having you again, and as promised, I've emailed you the name of the mattress. Enjoy! Nearest ATM is at the end of the block in the gas station. Property location is within 1 mile of public park, "Batterson Park" and a variety of additional parks with hiking and walking trails, ponds, lakes and water sports. 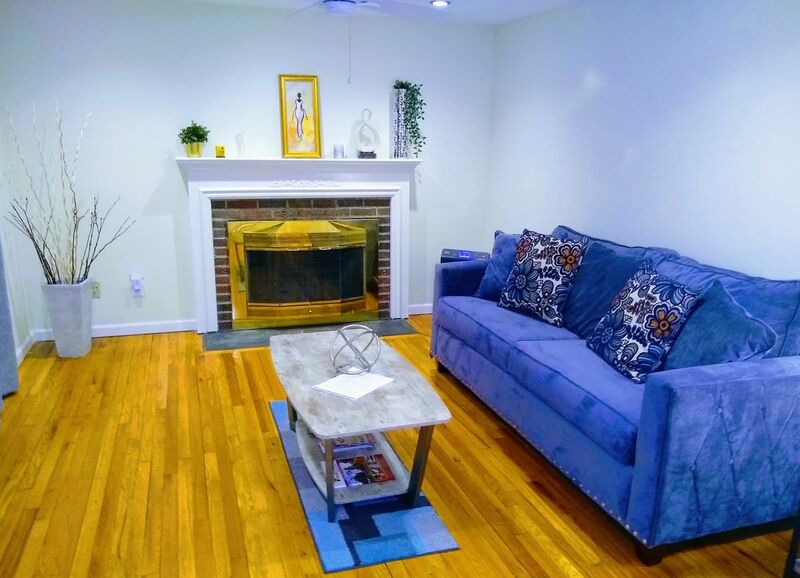 This property is centrally located to many activities in Neighboring towns including Farmington, Plainville, Southington, West Hartford, Newington, Berlin, Bristol, Avon, Rocky Hill and Hartford. Community recreation refuge with a lake. Family park with pond, sports and a good walk.